Kladdkaka, also known as the Swedish gooey cake, or Swedish messy cake. When uncut, it appears as a relatively harmless low chocolatey cake. Cut out a slice, and you will see its full potential and dangerous charm. Kladdkaka is so gooey it’s almost liquid. To me it could as well classify as a pudding. I’m not one hundred percent sure it can be taken onboard a plane for this reason. It’s definitely a cake you can’t say no to. And it’s a Swedish classic. Sweden is fattening me up. Ever since my first winter here, when in autumn nature dims the lights, my body starts demanding more food and I put up a couple of kilos. Then in the spring it’s all about getting rid of that winter fat. I must admit that I succeed pretty well at that. Sure the fact that in the spring I start biking everywhere again helps. What does not help is the amount of delicious cakes and the overall fika culture that Sweden boasts. I have already written about fika and the Swedish cinnamon buns, and even about innocent blueberry pies when blueberries are in season. What I have never really explored yet is the decadent world of Swedish cakes. Swedish cakes make you fat only by looking at them. Still unconvinced? Let me introduce kladdkaka. When I was a teacher, you can guarantee this was the recipe that 99% of the kids would demand. 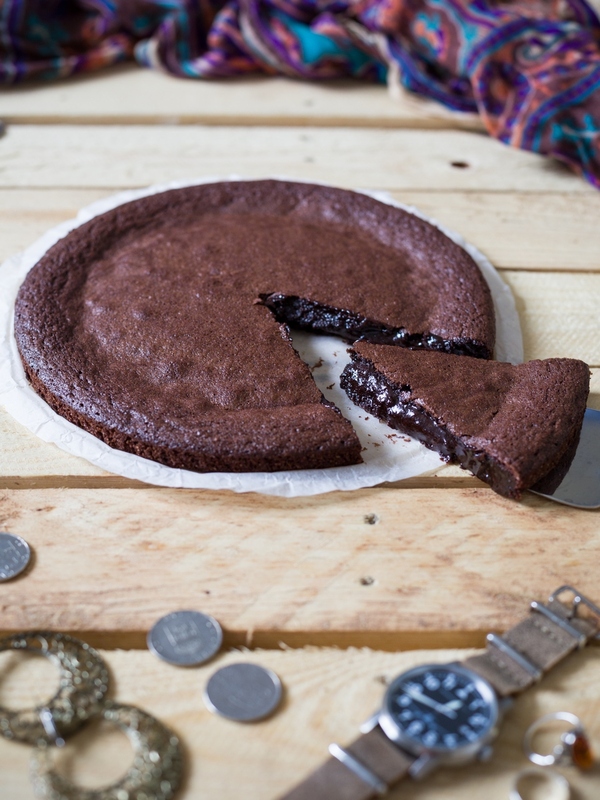 Everyone loves a good piece of kladdkaka. The closest thing you can compare it with is a very gooey brownie. But then again, you can eat brownies with your hands. I mean, you can hold a piece of brownie and feed it directly to your mouth with your hand. With kladdkaka it’s nearly impossible. You must have a spoon, unless you want to eat like a baby and get chocolate cake all over your face and hands (and clothes). 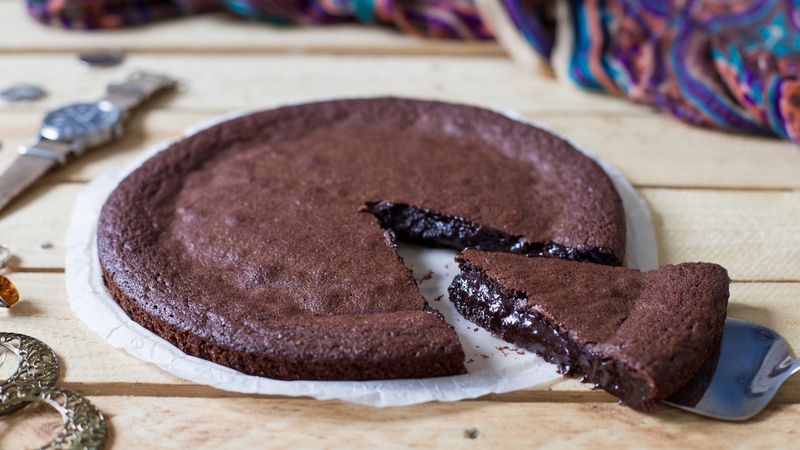 The trickiest part about kladdkaka is probably getting that right sticky texture. Not overbaking is key. Hey, if you overbake it it will still be a delicious and scrumptious chocolate cake. But that gooey effect is lost. So it’s all about the right timing. When you see that the sides are done but the centre is still wobbly is right when you want to take it out. No toothpick test here, you kinda want it slightly on the unbaked side. This cake needs to be low. 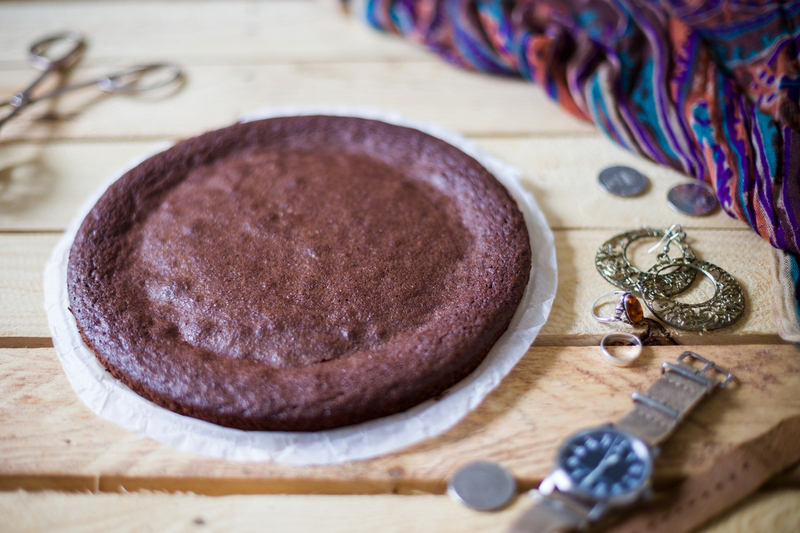 For the proportions listed in the recipe below, the ideal cake pan is 22 cm wide. Preheat the oven to 200°C. In a small saucepan, melt the butter and set aside. In a bowl, combine sugar, eggs, vanilla and salt and mix for a couple of minutes at low speed. Do not overmix - keep the speed low and stop when the ingredients are combined. Once combined, add the flour and cocoa powder and start the mixer again, always at low speed. As you are mixing, pour in the melted butter and continue mixing. Stop when everything is evenly incorporated. Transfer the batter into a springform pan and bake at 200°C for 17 minutes. As a general rule you should take the cake out when the sides look just done but the centre is still a little wobbly. Let sit for 10 minutes before serving. I have tried making this cake in an "allergy-free" version, making it both gluten and dairy free. I subbed the butter with a plant-based alternative and subbed the flour with a gluten free flour mix. In the gluten-free version I used 85 g of the flour mix. The Swedes are more athletic than me and easily burn off the winter fat going cross-country skiing every weekend. So they serve this cake with a side of whipped cream. Which is a very interesting addition, especially if unsweetened, as it will nicely balance the taste and texture of the cake. But it can as well be skipped, I guess, for fatness sake. Still, Sweden is home to this amazing gooey dessert that is also so embarassingly easy to prepare. So Sweden is a very easy country to get fat in. Ikea does a great job exporting Swedish taste in both interior design and food. Anyway Swedish cuisine may not be the most renown in the world but it has its glorious moments definitely worth exploring! I’m looking forward to reading more of your blog. Congratulations on your One Lovely Blog award nomination! This looks amazing, I can almost taste it from the pictures. This looks fantastic Eva! It looks similar to a chocolate mousse cake I make here and is a success but I will try your recipe too. I have to make some of these cakes soon since I promised my friends who helped me win a trip to Brussels on a contest that I would bake them the chocolate mousse cake with Belgian chocolate when I get back =) Keep going! Ohh mousse cake with Belgian chocolate sounds like a great combination! !